Saddle shoes. Camp shorts. Girdles. Bell-bottoms. Each plays a significant role as we follow B., the wardrobe's owner, through her buttoned-up Midwestern childhood to the freedom of miniskirts, sundresses, and New York City. 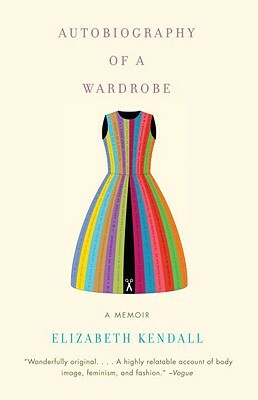 We watch as B. copes with the untimely death of her mother, makes a go of glamorous magazine work, and, after the inevitable false starts and fashion missteps, finally comes into her own.Part memoir, part fashion and cultural history of the last five decades, Autobiography of a Wardrobe is an exploration of the clothes each generation has embraced and the smallest details in which we are able to seek comfort and meaning. Elizabeth Kendall is the author of Autobiography of a Wardrobe, Where She Danced, The Runaway Bride, and American Daughter, and her work has appeared in The New Yorker and The New York Times, among other periodicals. In 2004-2005 she was a fellow at the Cullman Center of the New York Public Library, and in 2006 she received a Fulbright grant to do research in St. Petersburg, Russia. She lives in New York City.